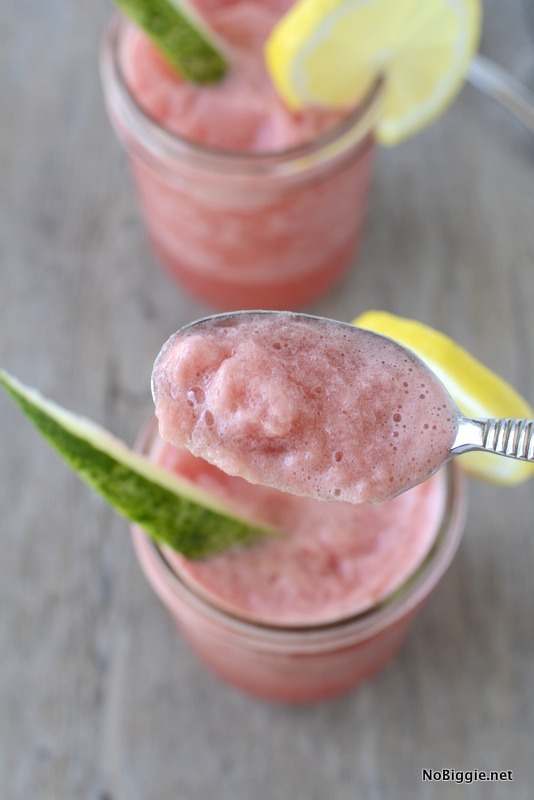 Frozen Watermelon Lemonade is like a watermelon frosting and is so refreshing in the Summer Time. 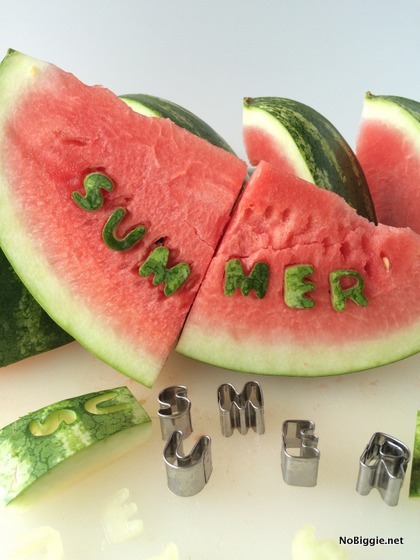 We’re in full Summer mode around here…never ready to say goodbye to Summer! That statement is sort of true. (wink) We’ve also been going through watermelons like crazy at our house. It’s the perfect late night snack, great hydration without the guilt…plus when it’s icy cold from the fridge it’s the best! 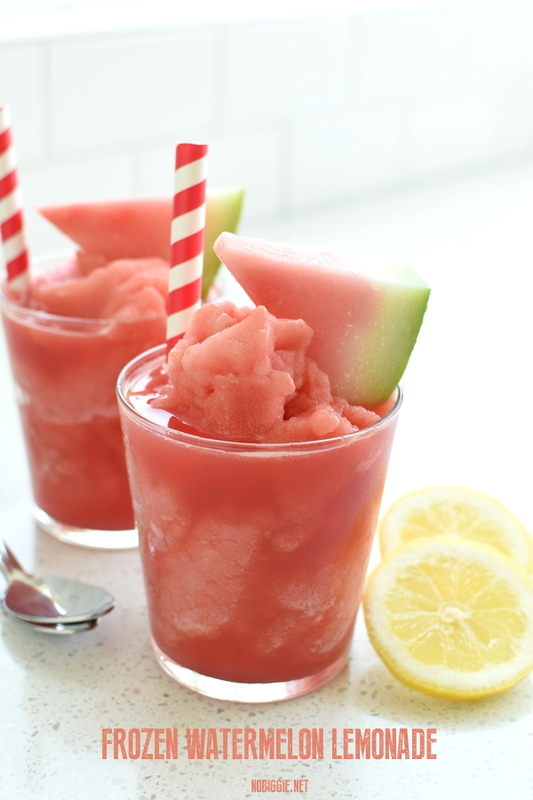 To mix things up, we made frozen watermelon lemonade, and it was so good! It’s kind of like a watermelon frosty. 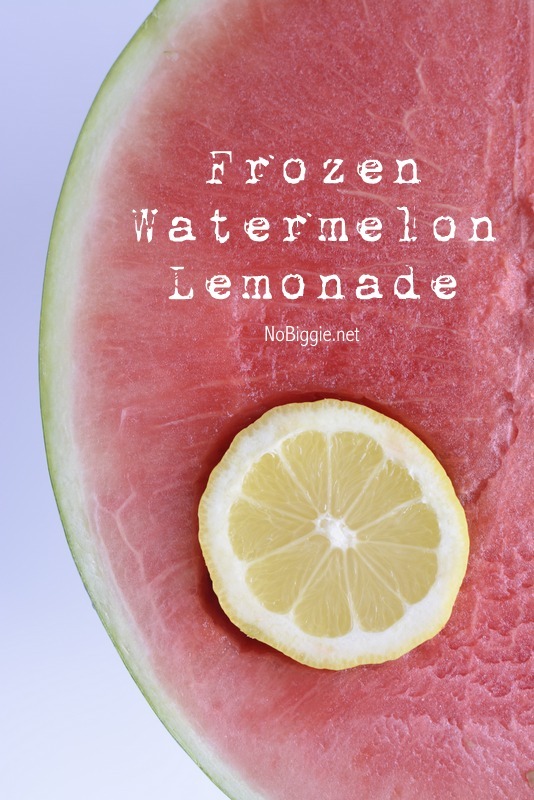 Frozen Watermelon Lemonade is like a refreshing watermelon Frosty and is so refreshing in the Summer Time. Peel and slice the watermelon into big chunks. 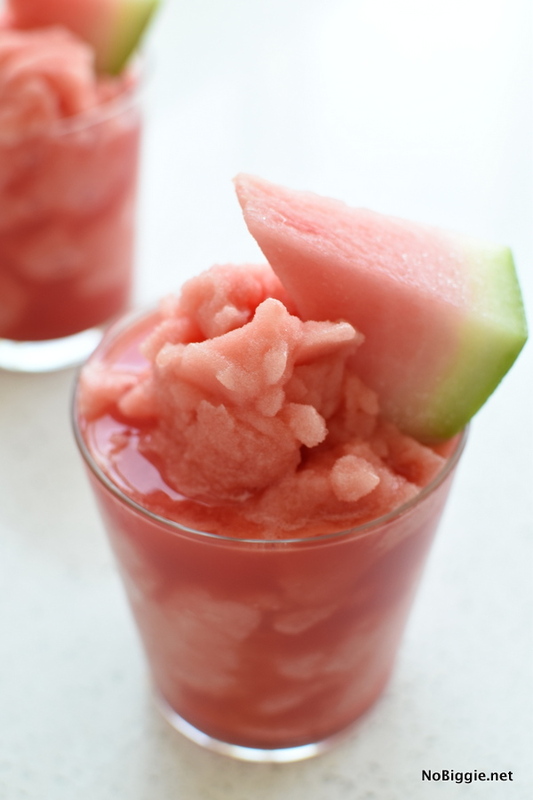 Blend the watermelon in sections. In a strainer, separate the watermelon juice from the thick watermelon pulp. Discard the pulp. Freeze the watermelon juice for 2+ hours until gently frozen. 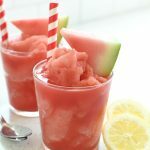 In your blender add the frozen chunks of watermelon juice (just eyeball it...no exact measurements), with the scoops of lemonade drink mix (or real lemonade). Blend until smooth. 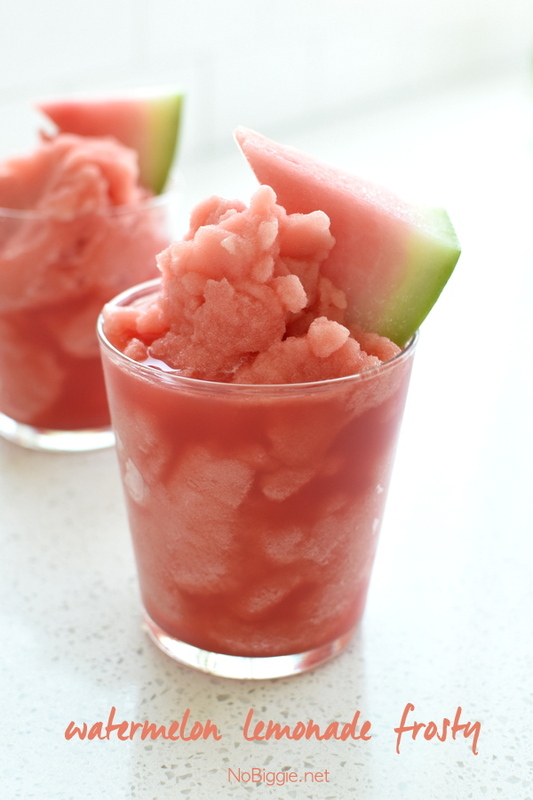 Serve with mini frozen slices of watermelon as a garnish. Optional: You can definitely use real lemon juice in this recipe rather than using the powdered lemonade drink mix. To make it with real lemon juice you'll want to make lemonade. Start with a simple syrup with two parts lemon juice to one part sugar. The powdered mix is definitely a short cut. You can also try adding some of a can of San Pellegrino Limonata for a little sour to the sweet. Here’s a fun little video we made the first time around. We took a little short cut with the lemonade drink mix, but you can totally make real lemonade if you prefer. To make lemonade you will need to make a simple syrup that is two parts lemon juice to one part sugar. If you’d like you can add a little from the can of Limonata, it gives it a nice sour tangy taste. Definitely sweet and sour, and perfect on a hot day. I hope you try it! Let’s here is for Summer! If you are not patient enough to freeze the watermelon juice, you should make sparkling watermelon lemonade! It’s one of our favorites! We also love these Watermelon Kiwi Popsicles.